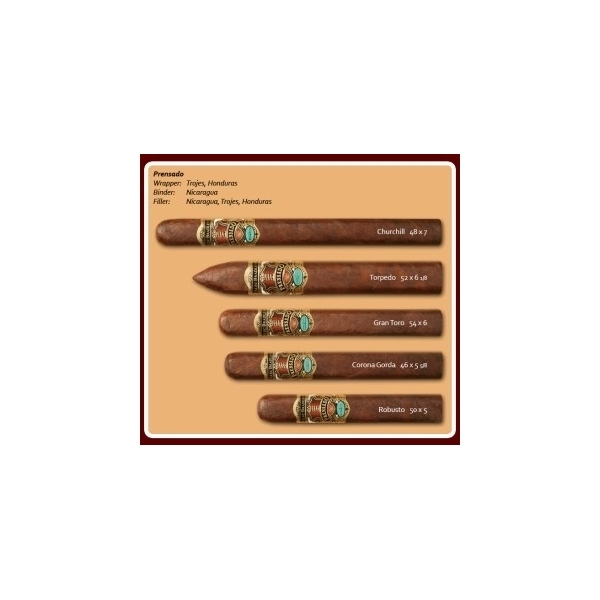 Alec Bradley Prensado was built around a new wrapper, the Corojo dos mil seis (Corojo 2006). The wrapper was grown in late 2006 on the farm in Trojes, Honduras and was in fermentation and aging through mid 2008. Alec Bradley Prensado was built around a new wrapper, the Corojo dos mil seis (Corojo 2006). The wrapper was grown in late 2006 on the farm in Trojes, Honduras and was in fermentation and aging through mid 2008. We started smoking and learning about the nuances of this wrapper in July 2008 and worked on this blend for over six months. Alec Bradley Prensado possesses an abundance of strength and natural sweetness as well as a tremendous amount of complexity. In addition, Prensado has a beautiful reddish brown cubanesque look and feel to it. 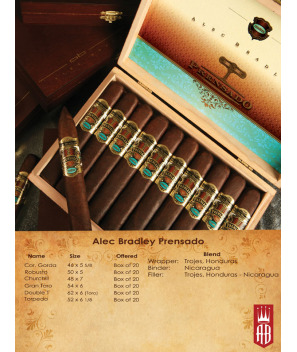 Prensado is Alec Bradley's first traditional pressed line of cigars and our most full bodied blend to date.